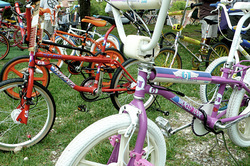 Old School BMX Bicycle Display and gathering! Old School BMX and Vintage Bicycle Gathering at Volksblast 2013! With the help of some local enthusiasts, we have decided to have an old school bmx gathering at Volksblast 2013. - It is free to bring your bicycles to display. - If you are selling or representing a business, we are asking for a small table donation fee. - Volksblast can not be responsible for bicycles on display, please bring stands, locks, and anything else you may need to assist you in displaying your bicycles.